Ashley Colburn has WON a prestigious Emmy Award for her documentary "WOW Croatia"
Proud Ashley Colburn with her 2010 Emmy Award for WOW Croatia. Mr. Goran Rotim interviewed Ashley Colburn in 2010 for the Croatian TV (HTV = Hrvatska televizija). Television show host and producer Ashley Colburn won two prestigious awards in June for her "WOW Croatia" show. The 2005 Fallbrook High School graduate received Croatia’s Golden Pen award June 12. 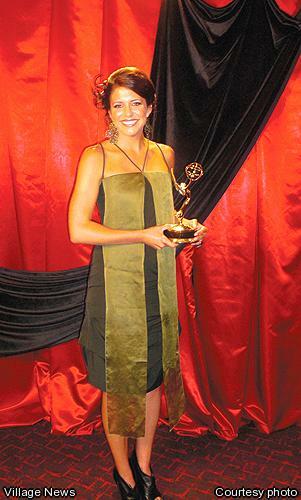 After her return to San Diego, she received an Emmy award June 26. "I’ve been told by all of my friends in Croatia that I’m now a superstar in Croatia," Colburn said. "They’re just proud that other people are aware of their country." Colburn graduated from Fallbrook High School in 2005. She served as a student intern for the Fallbrook/Bonsall Village News all four years. Colburn went on to graduate from Colorado State University in December 2008. She was a technical journalism major in college with a minor in Spanish. Her internships included a position with KABC News in Los Angeles, and she hosted a fishing show called "Ecofishing Adventures" on the World Fishing Network and Sportsman Channel. She continued to host "Ecofishing Adventures" after her college graduation, and her post-graduation activities also included sending Wealth TV, which is based in San Diego, the link to her highlight reel on her website. Wealth TV asked Colburn for an interview and subsequently hired her. After spending the 2009 San Diego County Fair in the media department, Colburn joined Wealth TV in July 2009. "It’s been the best year of my life. I wouldn’t trade it for anything," she said. "I’m so thankful for Wealth TV and everything they have done for me." Colburn became the host and producer of a show called "WOW." She filmed episodes in Nicaragua, Turkey, and San Francisco as well as Croatia. "The best part is meeting people from all around the world," she said, noting that she maintains those international relationships. Later this summer her new show, "Takeoff with Ashley Colburn," will premier on Wealth TV. She has already shot shows in Zurich and Zermatt, Switzerland; Rio de Janeiro, Brazil; Buenos Aires, Argentina; Bermuda, and Tunisia, and her future trips for the 13-episode season will include Macau, Spain, Tokyo, and another visit to Croatia. Croatia’s Golden Pen award honors one print media winner and one broadcast media winner from each of 20 countries. Colburn received the award for the best United States television feature. "The Golden Pen was quite an honor," Colburn said. "It was a great privilege to be able to receive the award. "Colburn was flown to Croatia for an all-expense-paid trip. She flew into Zagreb on June 9. The activities of the winners included a spa treatment at Spa Sveti Martin, wine tasting and a tour of the "wine road", gold mining on the River Mura, travel to the Plitvice Lakes National Park, wind surfing on the island of Brac, and visits to the towns of Split, Ston, and Dubrovnik as well as Zagreb. Prominent Croatian designer Branka Donassy gave Colburn a dress she also wore to the Emmys. The winners had a welcome dinner in Terbotz Castle in the Medjimurje region, and the actual awards ceremony was held at Scheier Hall in the city of Cakovec. "The best part about it was being able to meet journalists from all over the world," Colburn said. The Emmy awards for the Pacific Southwest Region were held at the Hard Rock Hotel in San Diego. Colburn won for the cultural historical category. "It’s all been good publicity," she said. She was asked to give an acceptance speech at the Emmys, and she dedicated her award to the people of Croatia. "They’re the ones that made the show really spectacular," she said. "It was an honor to be able to represent them as well." Wealth TV reaches approximately 10 million viewers across the United States and the Caribbean. In San Diego it is carried on AT&T U-Verse and Verizon Fios and can also be accessed through its wealthtv.com Website. Colburn’s goals include expanding Wealth TV’s coverage. "It’s been an opportunity that I know not many people get," Colburn said of her work at Wealth TV. "It’s been wonderful for sure." I have known Ashley since she was a little girl. You cannot find a harder working young lady from a more wonderful family. She deserves every bit of this success. I am born in the USA, 100% Croatian. Really enjoyed the fact that a fellow Fallbrook girl has earned this honor. Would like a copy of this piece of her work. Congrats Ashley! Ashley is a welcome and attractive addition to the usually boring male travel shows. Nicely done! Ashley Colburn, a personality that shines through on camera, she is super star material.